The subtitle is: Or What Happened to Anya on Her First Day of School. This is a fun twist on a back-to-school story, with a classic message about how everyone is different. From the creative mind of rising star Mike Boldt comes a hilarious and original tale about overcoming back-to-school jitters, making new friends, and taking things in stride. Anya wakes up to discover that she has grown a tiger tail. Yes, a striped tiger tail. It also happens to be the first day of school. What will the other kids think? Are girls with tiger tails even allowed to go to school?! Anya is about to find out. 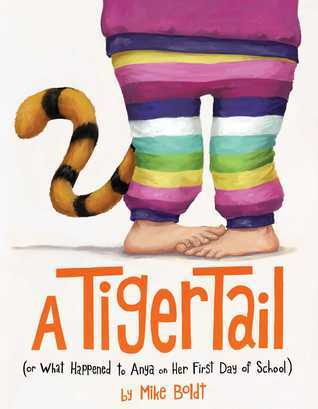 A Tiger Tail was written and illustrated by Mike Boldt and published in 2016 by Simon & Schuster Books for Young Readers. I loved the opening sentence, which is stretched over two or three pages where in the illustration we see the tail, but Anya doesn’t yet. This really builds up the suspense, because readers will want to see how she reacts. I appreciated this different take on the typical first day of school story. Even though I had a strong sense of how the story might end, the way it came about still had an element of surprise. A great example of how to take a “tried and true” theme or story and put a new spin on it. I love Mike Boldt’s style (big and bold) because it’s so great for read alouds! I also like the design of the book and the way the illustrations extend across pages. I thought this style brought an “up close and personal” feel to the story. I think this would be great way to introduce a discussion about going to school worries without drawing attention to anyone in the class (or introducing your own thoughts about what your students might be afraid of). Lingering on the last page would show students that everyone is different in some way. Make a game by creating several cards with different animal parts on them. Take turns choosing a card and explaining why it would be useful to have that part. Think of a time when you felt worried about being or looking different and write/draw a picture to tell about what happened. Share with a partner if you wish. Read Imogene’s Antlers by David Small, for a book with a similar idea and different situations.